Motivate students to revise their writing through self-publishing fiction, creating podcasts and YouTube videos, writing blogs, corresponding with others, and anything else for an authentic audience. Whenever I start talking about the importance of revising our writing with my classes, I show them this photograph: an over-the-shoulder shot of Barack Obama holding a copy of his Inaugural Address from 2013. It's a printed page covered with his handwritten edits. Words are crossed out, arrows go every which way, and there are notes everywhere. My point in showing this to students has always been: "Look how important revision is -- even the President of the United States takes the time to work on writing revision!" 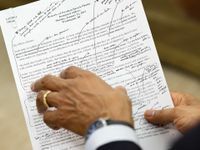 However, I used to overlook one key question when discussing the photograph with students: "Why did Mr. Obama care enough to revise his speech so much?" Undoubtedly, the answer is that millions of people around the world would be listening to the speech, and thus he wanted his writing to be clear, precise, and flawless. It should come as no surprise, then, that students care more about writing, revising, editing, proofreading, and perfecting their compositions when given a real-world audience. It's not just something that they've written for practice or a grade. It's a real piece of writing that will be read by real people in the real world. The world of self-publishing is more than just fan fiction and esoteric sci-fi. There are whole communities out there of budding writers sharing stories, giving each other feedback, and practicing the art of writing. Whatever kind of creative writing you do with your students, they can self-publish and connect with readers all over the world. Two of my favorite sites for students to self-publish are Wattpad and figment. This one comes with the added bonus that it forces students to read their writing aloud, which alerts them to all kinds of writing issues that would otherwise go unnoticed when reading silently. They can create podcasts about anything, but I've had students base them on National Public Radio's This I Believe series. Giving students the opportunity to literally voice their opinions is powerful stuff. Getting to share those opinions is even more powerful. PodBean is a great place for students to upload and share their podcasts with the world. As a blogger myself, I clearly value the power of writing short pieces concerning things that I'm passionate about. And guess what? So do students! They can create blogs about anything that interests them -- video games, sports, fashion, anything they choose. Not only will this passion-based writing energize them, but their words will also reach an audience that cares about the same things. I teach at a Google Apps for Education school, so having students create a public blog through Blogger is super easy, but edublogs, which is Wordpress' site targeted toward teachers and students, is also free. Learning to write letters, email, and other correspondence is an important skill in and of itself, but actually sending the correspondence to real people takes the lesson to a whole new level. I've had students write to prisoners of conscience around the world, with much success, as part of Amnesty International's Write for Rights campaign. However, students can also write to any public persona, such as a letter to their state governor about an issue facing their community, or an email to the author of a book they're reading. You could also go the old tried-and-true route of getting your students pen pals. Whatever you choose, the real power of this practice comes when students receive return correspondence. You can almost see their faces light up when they realize that their writing is deserving of a real-world response. The beauty of YouTube is that anyone can upload anything they want and instantly have an audience of millions. I've had students produce short, creative films based on books they were reading, but they can also create scripted how-to videos, screencasts, or interviews. This one is also great for giving students a chance to become amateur video editors and filmmakers -- not a bad bonus! Let’s face it. Most of us middle- or high-school teachers are only one of about eight that our students will have during the course of a year. We might build great relationships with them and they might respect our opinion, but for most of them, they have a limit to how much they care about our assessment of their work. And can we blame them for this? Of course not. After countless assignments throughout the school year, the motivation for students to really care about impressing teachers with their writing must be pretty difficult to muster by the time, say, April rolls around. For conventional writing assignments, students are usually trying to meet the expectations of one person -- the teacher who assigned it. However, with an authentic audience, students are driven by the knowledge that their writing will leave the school, go out into the world, and be judged not for their ability to respond to an assignment, but for their ability to reach other people through their writing. Do you give your students authentic writing assignments? Does it motivate them? Please elaborate in the comments below.